“Our priorities remain unchanged. We will be further strengthening partnerships with neighboring Russia, China and Central Asia states as well as with the USA, the EU and Asian countries”, President said. “We will be working to strengthen the Customs Union of Kazakhstan, Russia and Belarus and the Common Economic Space [which is a continuation of the Customs Union]. Our goal is to launch the Eurasian Economic Union. However, we clearly say that political independence of Kazakhstan is inviolable. Nobody should infringe on it. All the issues related to the Customs Union, the Single Economic Space and the Eurasian Economic Union should be solved by all the three member states concertedly without any detriment to Kazakhstan”, President said. "Currently we see the continuation of 2007-2009 crisis, that has hit hard the world economy. In 2013-2014 the global economy may experience another setback, for instance, decline in raw material prices. And it may have negative impact on Kazakhstan's economy. 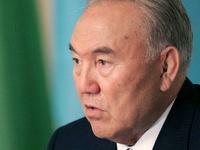 We must meet the situation head-on and be ready to convert the situation to our own use," Nursultan Nazarbayev said. The first challenge, according to President Nazarbayev, is speeding up of historical time. Then, there goes global demographic imbalance. The third challenge is the threat to global food security. Shortage of drinking water, global energy security and lack of natural resources were mentioned by the Kazakh Leader as well. The third industrial revolution is the seventh challenge. Growing social instability, crisis of values and threat to new world destabilization are the 8th, 9th and 10th in the list of challenges. The Leader of the Nation gave special priority to the Russian language in the "Kazakhstan-2050" Strategy. In particular, President Nazarbayev noted Russian should be treated with due care because proficiency in this language is a historical advantage of the nation. "Russian was out link with the world culture, science and it is still widely used in the country," the Head of State underlined. Nursultan Nazarbayev also called on youngsters to learn English. The Kazakh President is confident it will open doors to a better future. According to the Kazakh Leader, the new generation is already good at three languages: our children speak Kazakh, Russian and English. "In ten-twelve years the new generation will be 100% trilingual," the President said. Kazakhstan is to develop the State Program to fight religious extremism and terrorism. "I comission the Government together with the Presidential Administration to develop the State Program to counteract religious extremism and terrorism. However, the fight against extremism should not turn into witch hunt or war on religion. The issues of religion require thoughtful approach and extreme caution. The state should not interfere into the life of religious communities. We should preserve the traditions of tolerance and latitude in religion," the state-of-the-nation address of President Nursultan Nazarbayev reads. "I am confident that Kazakhstanis of 2050 are well-educated and free people proficient in three languages. They are citizens of the world. They are open to new knowledge and like to travel. They are hard-working and patriots of their country," the Kazakh Leader said. The President is sure that Kazakhstan of 2050 is the Universal Labor Society. It is a country with strong economy that offers the best education and medical services. Its citizens are free and equal and respect the rule of law. "I am convinced we are on the right path. If we remain strong, we will be respected," Nursultan Nazarbayev noted. On December 14, the Head of State summed up results of the implementation of "Kazakhstan-2030" Strategy and presented the new "Kazakhstan-2050" Strategy.